Howdy folks! Excuse me for not beeing in my writing mojo lately. I am under so much time pressure and am kind of freaking out about the exams and all the preparations I still need to do. I wish it were July already! First I want to say a little somthing about this dress. I got it from Asos with a giftcard Cynthia from Go Chic or Go Home send me for my birthday. So sweet of her! It was quite the hassle to get this dress to me though. It got lost in the mail, but eventually arrived three weeks after I placed my order. I can wear it both as a top and a dress, so eventhough the busy print, it’s a really versatile piece that I’ll enjoy wearing all summer. For the first time in weeks we get to enjoy some sunshine here in Belgium! Our little country has been doing it’s name of a rainy place more than justice the past few weeks! I’m glad the April showers seem to have moved on and these pale legs of mine finally get to enjoy the sun. Yesterday, K and I even layed down in the sun for a while. He gets tanned SO fast! It’s unfair, haha. White and red are about the only two shades my overly sensitive skin can do. Hooray for sunblock! And ice creams and strawberries. ‘Cause that’s what sunny days are made for! Next Post Closet Cleaning: Keep it clean! Wauw, dat kleedje is echt prachtig! ah i think the dress looks fantastic on you! i hate when the mail service messes things up. always a bummer. i'm glad it made it home to you though. you look wonderful. Gorgeous outfit. That dress is amazing and so perfect with the blazer. I love this! Your floral dress is so cute!! And I love your little yellow bag! And thank you so much for your comment on my blog! Would you like to follow each other? What a beautiful dress! That print definitely pops, it looks great on you 🙂 And good luck with the exams! Ginger, the dress is beautiful! I love the blaser too! I love the color of your hair! hahaha that's right! I(as a brunette) will stay 20' in the sunlight and then I will be like a moving chocolate. love that dress! and you accessorized it perfectly 🙂 and I feel ya on the pale skin issue, ha! I love that jacket! And I can understand the sunblock thing, I'm the same way! Ooh I know what it's like to have such pale skin that never tans… anytime I'm around my friends I feel like I stick out like a sore thumb! You look wonderful – I love that dress! lindo! lindooooo! so beautiful dress! love it! 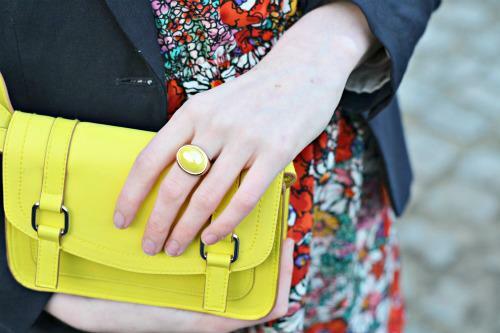 I love the combination of your dress, blazer, and the amazing pop of yellow in the bag! Pale legs = not just a ginger problem. I went on a sunny vacation back in december where I actually burned. My legs are disgustingly pale again. What a pretty floral dress! Love the dress–great choice and what a great present! Love that bag–I have the same one and can't stop carrying it! Your 'pale' legs are lovely! You look awesome girl! Your outfits just keep getting better and better. I'm loving it. Good luck with the stress. I know you'll make it through. We're already halfway through May so July is on its way!! Oh girl I feel ya! super cute outfit! We need to start a pale leg guild. Seriously. your title cracked me up, girl. i think you look smashing! that floral print is so vibrant, it makes me smile! xo. You look absolutely stunning miss! that is the cutest dress ! Ah, the dress looks so lovely!!! oh really nice pictures and very nice outfit ! The print and color of that dress is absolutely gorgeous on you! Nikki, White and red are my two colors as well. Sigh. Wow this is really, really lovely! The pattern and colours on that dress are perfectly suited to you…and oh-so stylish 🙂 I've missed your posts but totally understand being busy…I haven't kept up well myself. Love you tons! I'm so glad someone else knows my pain! I'm a redhead too and totally know how you feel. and hey our blog names are similar! Beautiful dress — love the print! we think you are darling! i get where you're coming from…i don't have red hair but my legs are practically transparent. You definitely rock your paleness so it's all good! I embrace it too! Also that dress is so cute! Especially paired with your blazer and that amazing yellow satchel bag. That dress is gorgeous, such a fun print and it's perfect with that blazer! Nice outfit!I love your bag and ring! You look so cute! Glad that dress finally made it to you 🙂 I hear ya on the sunscreen – my fiance tans so easily but all I do is burn. That's the life of a redhead! Love the dress! Perfect for summer. Living in London, I completely understand taking in the sunshine whenever it decides to come out for the afternoon. Strawberries and ice cream are the perfect complement to warm days. 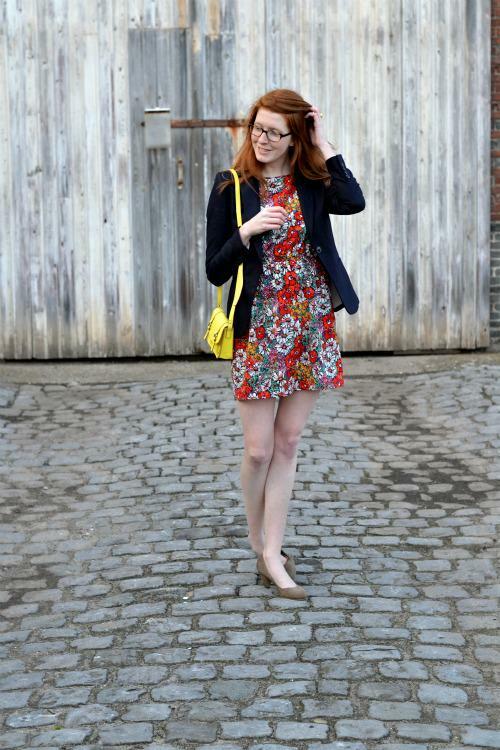 Love the dress on you–the length is perfect and the little yellow bag–perfection! Oh my gosh, I am so absolutely in love with that dress! !